I sat on a ledge of bedrock above two deep, green pools and took in the warm sunshine. My skin was cold from the chilly June water of the South Fork of Indian Creek. Cool spray swirled up from the little falls at the head of the nearby pool. The surrounding mountains, green with timber, have snow-pack which lasts until early summer. While sitting in the sun, I took out my pocketknife and began digging gravel out of several foot-long crevices in the bedrock. Within twenty or thirty minutes I was thoroughly warmed up, and had enough gravel to almost fill a fourteen-inch gold pan. So, I went back up to the car, got my gold pan and a couple spoons, to dig the sand and gravel out of the crevices. After a few minutes of panning, I had a thin streak of fine gold in the curl of the pan, and one nugget that was as big as the nail of my little finger and a quarter inch thick! This prospecting incident took place in 1965, on a creek in the Siskiyou Mountains, near the town of Happy Camp. Gold is Happy Camp’s claim to fame! The old 49’er miners expanded California’s gold hunt to areas outside the famous “Mother Lode.” Between 1850 and 1855, thousands of prospectors packed their horses and mules over age-old indian trails that wound through these rugged mountain canyons. For nearly a hundred years afterward, gold was the resource that fed and supplied the white pioneers of the Klamath Mountains. Montezuma, Bunker Hill, Classic Hill, King Bill, Blue Bar, Wingate, Know-Nothing, Hotelling, Ti Bar, and other mines, including Gray Eagle and Quartz Hill, drew men and women to this mining country year after year. 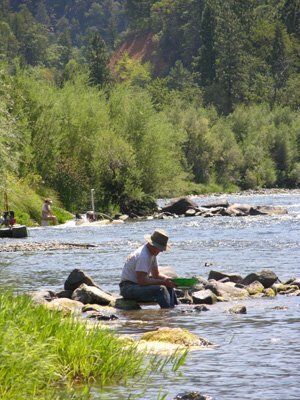 Gold is in the Klamath River! Nuggets are in the creeks! There is gold throughout these Siskiyou Mountains! For example; let’s consider Indian Creek. The Indian Creek drainage flows south into the Klamath River at the little town of Happy Camp, California. Major gold discoveries were made there in the 1850’s. This watershed is comprised of 86,000 acres, and ranges in elevation from 1,100 feet to over 7,300 feet above sea level. Four major creek-drainage systems are in the watershed, in addition to the main stem of Indian Creek. This portion of the Klamath Mountain Province has a diversity of plants, animals, trees, and geological features that is perhaps greater and more varied than in any other region in the United States. I’ve tallied the varieties of conifer tree species at twenty-three within the Indian Creek watershed. Besides conifers, there are alders, oaks, willows, chinquapin, dogwood, and maples. In addition there’s a long list of brushes, bushes, and shrubs; plus there is another list of grasses, forbes, and mushrooms. Deer, bears, foxes, mountain lions, skunks, raccoons, owls, eagles, ospreys, fishers, mink, salamanders, frogs, and rattlesnakes are just some of the wildlife species found here. Geologically, there are places with as many as eleven different soil and rock-types within just this single drainage! There are areas of hard peridotite bedrock ( the host-rock for platinum and diamond) that have shallow soils; often on steep mountain slopes. There are nanny and clallam families of soil-types that have deep, gravelly soils; plowed and tilled by glaciers, thousands of years ago. There are areas of skalan family soils that are fractured metamorphic rock and gravels. There are downstream areas of clallam river-wash and holland-aiken family-types of soils that are in alluvial fans and terraces. Gold settled to the bottom of these deep, mixed alluvial river-wash gravels! Get to the bedrock, and you will get to the gold! Gold is prevalent throughout this entire mountainous region. You can search for quartz ledges, gold laden rock outcroppings, and gravel beds of ancient streams and glacier moraines. It seems much easier to allow gravity, and the downstream movement of loosened sediment to place the gold on the bottom of the streams. Like a giant sluice box; the movement of water and the constant geological shifting of the earth collects and concentrates the heavy sediment in the crevices of bedrock. Go to the creek’s bottom. If the watershed has gold in its soils upstream, there will be gold on the bedrock. You will find gold there! You can’t find gold there!” “That was all mined out a hundred and fifty years ago,” said one misguided man, referring to a portion of Indian Creek. Let’s stop and consider this man’s statement. A little research into climatic history tells us that heavy rains and flooding waters recruited and redistributed gravel and large volumes of sediment during the years of 1890, 1955, 1964, 1974, and 1997; to say nothing of the flood-events of thousands of years past. Following the heavy mining operations of the mid-eighteen hundreds, there were periods of wet conditions such as 1870-1910, and 1938-1975; with annual rainfall ranging from 60 inches to 105 inches per year. Each and every time a major storm event occurs, including torrential summer thunderstorms, causes landslides, mudflows and sediments get transported downstream. All soil-types are involved. Gold is on the move! New gold is brought down from the mountains in this manner. 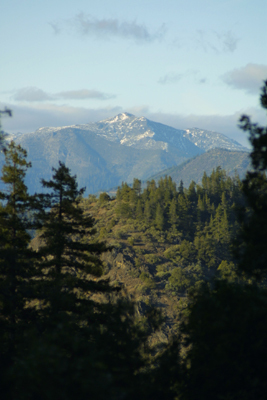 Mining took place in many areas along each of the major streams of the Siskiyou Mountains. The idea that gold is “all-mined-out!” is totally wrong! It ignores the fact that sediment, carrying gold, is constantly being shifted, moved, and concentrated. Also, not all areas of gravel beds were mined in the past. Rex continued, with a glitter in his eye. He loved telling stories of his own experiences. “Me and another fella hiked around in the creek and side-streams on the east side of Preston Peak and El Capitan. Someday, I’ll tell you or your dad what we found and where it is.” Rex told of doing most of his prospecting with simple tools and a lot of hiking. He found enough gold in the creeks closer to home, but he always liked the adventure of searching the mountains. He made his own metal detector, and was the first person I knew of who had such a device. He swore that it worked, and he warned that its weird sounds could attract unwanted animals, like bears and mountain lions. “Well, are you going to tell me just what gold-secret is that you’re talkin’ about?” I asked, jokingly prodding him. “We were looking around in South Fork of Indian Creek back in the middle of the ‘60s when we came across a rib of bedrock that was situated in such a manner that it caused the heavy gravels to collect just behind it. In times of high water, most of the gold goes right to the bottom. That was the greatest pocket of nuggets that I’ve ever found in my life,” Rex exclaimed! He then paused and leaned forward to take a drink from a full glass of whiskey and water. In 1969, while I was hunting along the ridges of Copper Mountain and Cedar Crest, I found some very old mining tools. I told my dad and one of my uncles about this find. They said that they knew of an old prospector that mined in that area years ago. They said that he was very secretive. He bought a scant amount of supplies in Happy Camp each summer and then lived off the land. He came out of the mountains in the late fall each year and just left town. After many years of “city-living” off his rich findings, he came back to Happy Camp to tell someone else about his secret diggings. Being in his seventies by then, he felt it to be important to let somebody else have some of his find. So, he chose to tell my uncle. When this old-timer went to the mountains to show my uncle the diggings, he couldn’t find the right location! Too many years had passed. He couldn’t remember the right place! The site where I found the old mining tools seemed to fit the description that the old man had given to my uncle. His find was a ledge of jade that had gold and titanium in it. I checked this out with an assayer. He said that this was a genuine geological possibility. I have not yet found that outcropping of jade, only the mining tools with bone-white handles. It might seem like this is the telling of more than one story, but you have to remember that gold runs downhill! 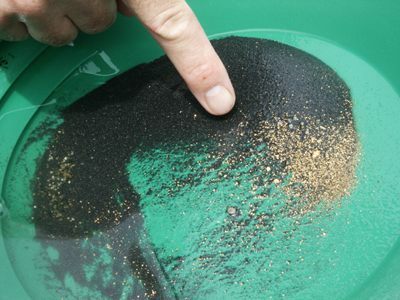 Where gold accumulates in the streambeds, it has to come from sources in the mountains above. Jade with gold in it has been found by me and other members of my family in this watershed. 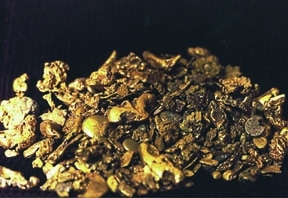 The gold in Rex’s nugget-pocket probably had come from more than one exposed site with gold. More sites that have to be upstream of Rex’s bedrock pocket. The fact that he never mentioned jade with gold in it only seems to confirm that South Fork gold comes from more than one source! “I returned to the rib of bedrock every four or five years; especially after heavy rains and high water. Each time I came back, the bedrock had more gold nuggets and smaller-sized gold for me,” Rex remarked as he finished his tale. He ended his story by saying that one of these days he would tell us where this nugget pocket was, but he never did. Rex died of heart problems a little while later, taking his golden secrets with him. If you want to find gold in your lifetime, start now! There is gold here! With every storm, gold is shifted from one place to another in the gravels. Placer gold is not hard to find! Be ambitious, be selective about your mining location; and when you get to bedrock, work it thoroughly! Get every little bit of sand and gravel out of those crevices! One time in the 1950’s, my grandmother was helping my grandfather mine an exposed piece of bedrock upstream of the old Muc-a-Muc Mine. She worked on and cussed at a rock that was hardbound in a narrow crevice. After working most of the gravel out from around the wedged rock, she used a steel bar to finally pop the rock out. It turned out to be a gold nugget that would cover the palm of your hand and was one inch thick! And that is a true story!